This is latest news that UPCMET Counseling Schedule has declared on official website. This Counseling Schedule will be held off centres and filling of choice will be held 16th June 2015 to 20th June 2015. Those candidates who had marked their name in the UPCMET 2015 Main Merit List, they are required to attend first counseling schedule. Those candidates who are going to attend first counseling schedule, they can download official notice for filling choice for admission from direct link given below. Deposit the Counseling Fee of Rs.1500/= in the Bank Account No. 00831011001218 of UPUMCWA with Oriental Bank of Commerce, Civil Lines, Bareilly (IFSC – ORBC0100083) through Internet Banking or NEFT Transaction or CASH Deposit latest by June 19, 2015 (Friday). Then upload receipt of counseling fee online at www.upumcwa.org. It will take 24 hours for this process. On very next day after 10:00 AM, upload soft copy of documents (10th, 12th, Caste Certificate) in JPG format online to the application. Remind that Caste certificate must be issued on or after 01st April 2015 by competent authority. Submit your choice of preferences for admission in the member college. Choices can only be locked till 20th June 2015 (Saturday). It is advised to read and edit the choices for admission by the candidates before LOCK. NO CHOICE WILL BE CHANGED AFTER LOCK. Then PRINT the Choice Submission Report for your records. Uttar Pradesh Unaided Medical Colleges Welfare Association (UPUMCWA) had conducted Uttar Pradesh Combined Medical Entrance Test also known as UPCMET 2015 Entrance Exam on May 30, 2015 (Saturday) at 17 various exam centres i.e. Agra, Allahabad, Bareilly, Chandigarh, Dehradun, Ghaziabad, Barabanki, Jaipur, Kanpur, Kolkata, Lucknow, Meerut, Muzaffarnagar, New Delhi, Patna, Ranchi and Varanasi. 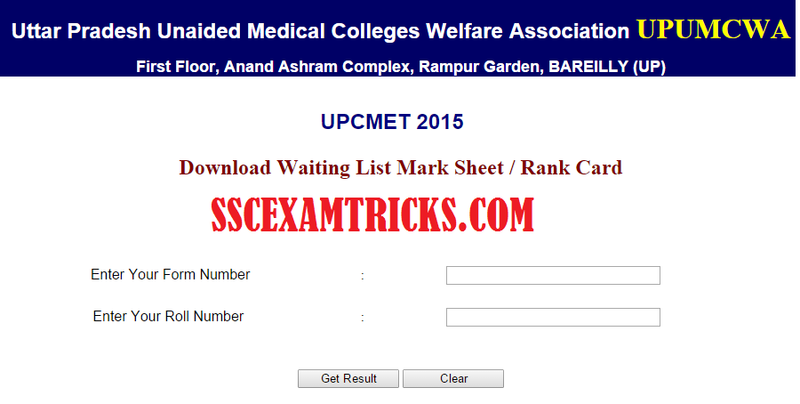 A huge numbers of candidates had appeared in UPCMET 2015 medical entrance exam and waiting for their result. It is latest news that UPCMET 2015 result has declared on 10th June 2015 on official website www.upumcwa.org. 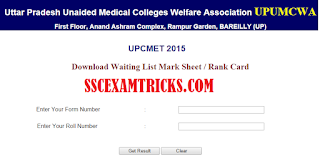 Those candidates who had attempted UPCMET 2015 medical entrance exam, they can download UPCMET 2015 result from the direct link provided below. UPUMCWA is conducting UPCMET 2015 Medical Entrance Exam for admission in MBBS Course for Academic Session 2015-16 in member colleges. There are 14 MBBS colleges participating in UPCMET 2015 medical entrance exam for admission in first year of MBBS course. UPUMCWA had invited application form (offline) from 15th November 2015 which was required to be submitted to address Coordinator UPCMET 2015, First Floor, Anand Ashram Complex, Rampur Garden, Bareilly – 243 001. The last date of submitting UPCMET 2015 medical application form was 11th May 2015. A huge numbers of candidates had applied for UPCMET 2015 medical entrance exam across all over the state. UPCMET 2015 medical entrance exam was scheduled to be held on 30th May 2015. UPCMET 2015 Result will be declared in 2nd week of July 2015. Minimum cut-off pass percentage of marks in Paper-I shall be 50% (40% in case of SC/ST/OBC) and 50% in Paper-II (40% for SC/ST/OBC) to be secured in this test. In general, merit shall be determined on the basis of marks secured in Paper-I only. Paper-I will be of 200 marks and Paper-II will be of 50 marks. But combined maximum marks for merit in UPCMET would be 200 i.e. Total marks of Paper-I. Paper-II will be of qualifying nature. UPCMET 2015 Counseling will start from 15th July 2015 onwards for admission in member medical colleges.